Ireland-based discount airline Ryanair's executive board has just approved plans to start a new transatlantic airline that'd fly between "about a dozen" European and as many US cities for ridiculously low rates. It could be operational in five year's time. 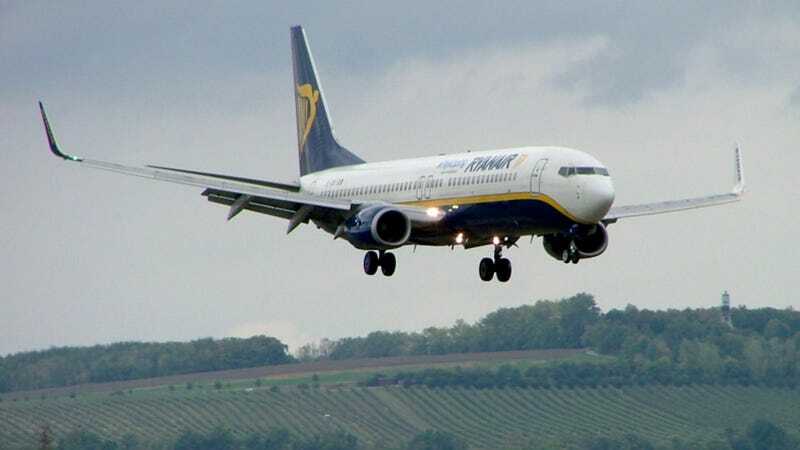 Ryanair's Head of Marketing Kenny Jacobs told The Financial Times "some subsidized promotional fares would cost ($15), other one-way tickets would be priced at ($150) or more, and the airline would fill up to half its jets with more expensive premium seats." Hey, I didn't say they'd make getting a $15 flight easy. FT says flights would connect "London's Stansted airport, Dublin, Cologne, Berlin, others in Spain, Italy, and Scandinavia," to "Boston, Chicago, Miami, New York, and Washington" in the US. Ryanair's longtime schtick was "supercheap ticket price" ...then pay out the nose to use the jet's facilities/overhead bin/oxygen. More recently they've tried to ease back just a little on thrift and allegedly provide a less miserable passenger experience. They must be doing something right; because about 87 million people rode their jets last year according to their traffic report. The airline's plan for entry to the US market depends on them coming up with a new brand name, and getting their hands on enough airplanes. Fortune says Ryanair's has "far better cash flow than its European competitors" and a great credit rating, which they seem to think could get them the hardware they need. Alright so, a company "pursing a plan" that "might offer promotional fares as low as $15" doesn't mean WE'RE GOING TO LONDON FOR FIFTEEN BUCKS! But Ryanair has had success getting people around Europe for short money. It'd be pretty exciting if they could port the same principles to transatlantic travel, and they just got a whole lot closer to making that happen.